Update: This is technically a beef stock, as it uses roasted bones. I’ve recently discovered a magical elixir. It helps me recovery from workouts faster, protects me from incoming radiation, keeps my skin looking great and it tastes awesome. The magical potion is a homemade beef broth. It takes 24-72 hours to make, but is worth the effort. I use the recipe found in the book Nourishing Traditions by Sally Fallon. 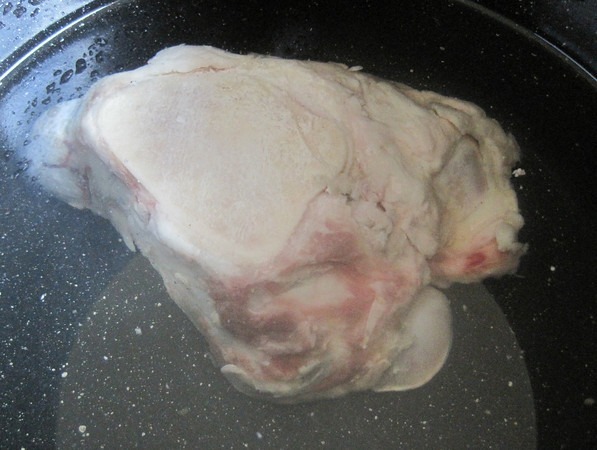 Put knuckle bone into stock pot. Add 1/2 cup of vinegar. Cover with water. Roast Beef Soup Bones for 30-45 minutes at 350 degrees. 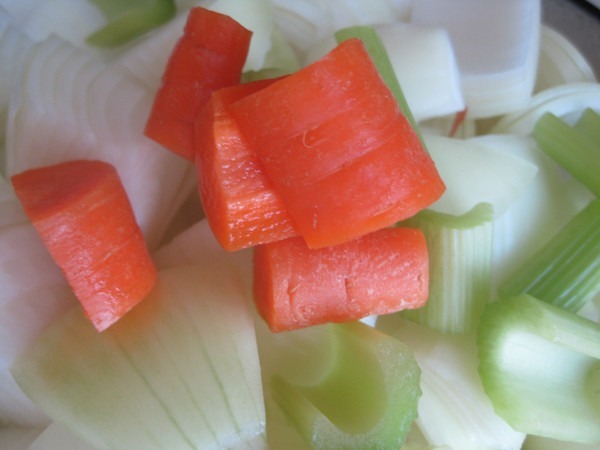 Cut up a few onions, carrots and celery sticks. Add them and the roasted meat to the stock pot. Cover with water. Turn on the heat. Bring it to a boil and then lower the heat until you achieve the slowest simmer possible. Cover the stock pot. Periodically you want to skim off the large bubbles with a spoon. These are impurities. I do this maybe 5 times in the first few hours and then leave it alone. Let it sit on the stove with a very low simmer for 24-72 hours. 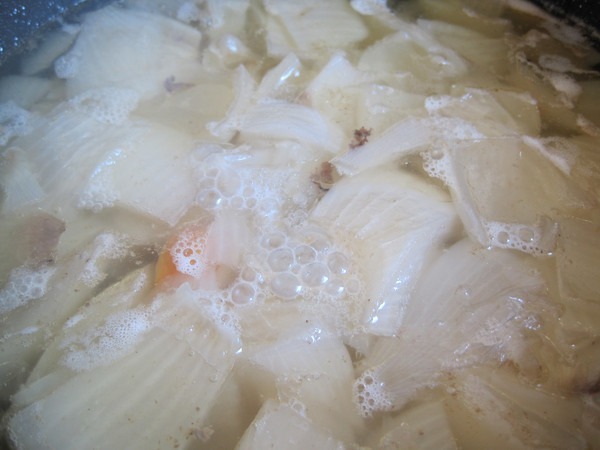 The simmer should be slow enough that you can easily count the bubbles as they rise to the surface. With 10 minutes remaining, add a handful of parsley. Turn off the heat and let it cool. Using tongs, pull out the large chunks of meat and bones. Throw that away. Then using a strainer, filter out everything else. Pour the broth into jars. Unless you plan on using the broth in the next day, put the jars into the freezer. There you have it. I do this about once a month. I then add some broth to whatever stew or soup I am making. Next Think You Know Vitamin D? @TigerAl – Good ideas. Do you use whole peppercorns or do you crush them first? Whole so that you can strain them out along with the bones. 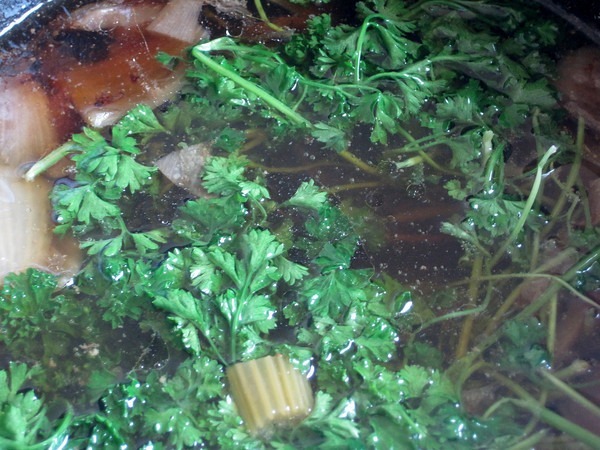 My mother made this type of broth with chicken, beef or lamb/goat bones. It makes for a really nice meal-size soup as well, if you add rice or pasta and a few veggies. @TigerAl – That makes sense. Thanks! So you toss all of the veggies too? Seems like they’d be tasty after all that. @Nick – The 24 hour simmer has the effect of extracting all the flavor out of the meat and veggies. It all ends up in the broth. i just made my second batch of this. it is so easy, just takes time. i used a bunch of sad kale and carrots from my garden. i am always amazed at how much it cooks down. does yours cook down by about 2/3rds? i keep the simmer as low as possible. @Chuck – Mine hardly cooks down. My simmer is super low. Like a single bubble surfacing every 2-3 seconds. OK, I suspect I have it a tad too hot. Mine bubbles much more. I bet mine is super concentrated and strong compared to most. I do have to water it down when using in some recipes. have you ever made pho? i made some this past weekend. it was DAMN good and quality beef broth is the main ingredient. relatively easy and i cannot wait to do it again. @chuck – No I haven’t. What cut of beef did you use? I had a round steak I used but anything would work. Followed recipe and simmered the steak in the broth for an hour. Way over done. Next time, I will grill the steak separate. Man was it good, just like the pho restaurants. 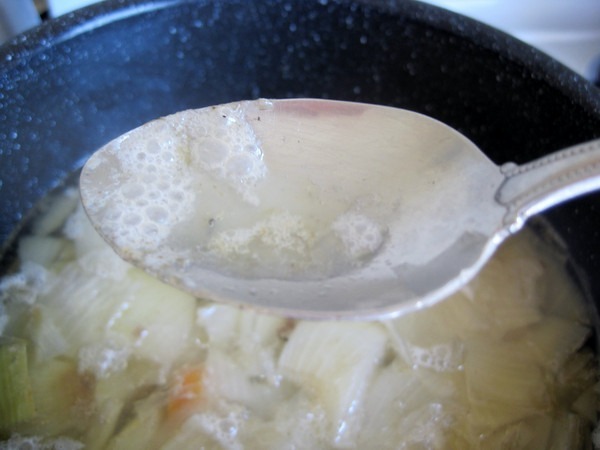 I’ve been on a broth-making kick lately and was wondering – what do you do with the layer of fat on the top? Most recipe books and sites say to discard it. What do you think? @Lillian – I eat it. If the animal was healthy, then its fat should be as well. If it were chicken stock, I’d discard it. 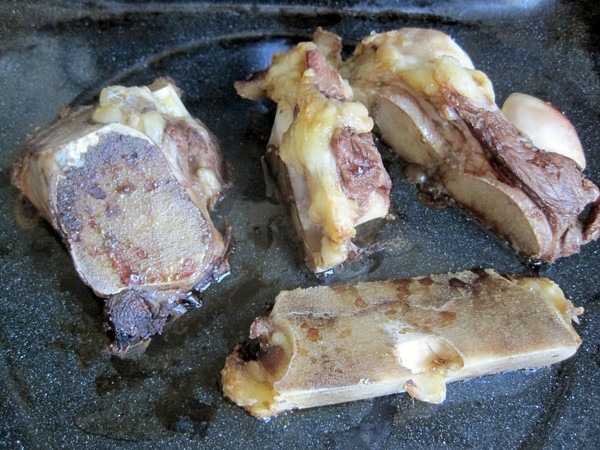 I made my bone broth with soup bones & oxtails. VERY low simmer for @ 20 hours. Result: dark, rich broth but NO gelatin at all. What did I do wrong? I live in Newport Beach, Ca. & nowhere here can I find knuckle bones. Would Blue valley Meats ship these? Help! @Lynn – I don’t know why your broth came up short. I go to the Asian markets for different bones. 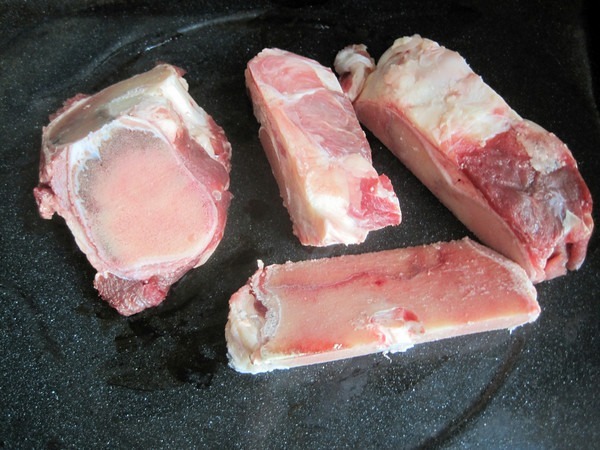 The bones will be conventional and not pastured, but since you’ll skim off any fat, it likely isn’t much of a concern. I have a stock going now from bones I got at the Korean grocery store. Amazing quality. How many cups of broth do you generally get out of this? Do you target a specific amount of water, or just fill whatever pot your using? @Nick – Now I use a pressure cooker. I add about 3-4 pounds of bones. Bring the liquid level up to the line of my 8 quart model. So no strict measurements. I fill about 3-4 quart jars.